Looking for more videos like that? Check Appery.io YouTube channel for many more videos. This video shows how to build and test an Ionic SMS app using Nexmo API. The video tutorial first shows how to create a backend to invoke Nexmo API. Then the Ionic app is created which uses the backend. The app is then tested in the browser and on the device using the Appery.io Tester app. The video also shows how to build a binary file for Android and iOS. Looking for more videos to help build mobile apps? Check out the Appery.io YouTube channel. Using API Express to connect to an external REST API. https://randomuser.me/ is used for the API. Importing API Express service into the app (App Builder). Designing the app UI (1 page). Binding and using the service from the page. Looking for more videos? Visit the Appery.io YouTube channel for many more short videos. This short video shows how to import backend services APIs into your app. Appery.io services consist of a cloud database, Server Code for custom app logic, and API Express for enterprise integration and service orchestration. Our YouTube channel has many more short videos where you can learn how to build apps fast with Appery.io. 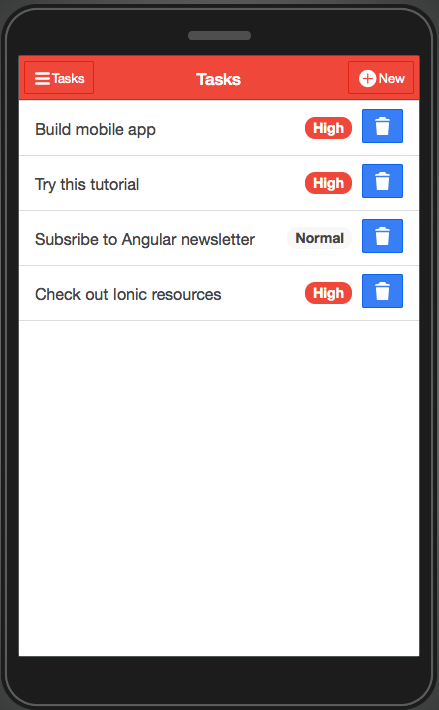 Appery.io App Builder for Ionic. You should finish this tutorial in about 10 minutes. This 8-minute video shows who to build an Ionic app with a backend and external API. The app is then tested in the browser. https://randomuser.me/documentation is used for external API. Want to learn how to build business mobile apps fast – check our the Appery.io YouTube channel for many more videos. What is Appery.io App Builder? In three previous blog posts I told you about Appery.io Server Code, Push Notifications and API Express. Appery.io App Builder is another core component in the platform. The App Builder is where you build your app (the client side). The App Builder is where you design and build the app pages, drag and drop UI components, define navigation between pages and any other UI logic. 3rd party and custom Cordova plugins can be added as well. Right inside the App Builder you can launch the build service which will package the app for either Android or iOS. If you are creating an HTML5 mobile app, you can host the app with the Appery.io platform or export the web resources (HTML/JS/CSS) and host it on a server of your choice. Every mobile app has to talk to some backend or server. Your app can easily use Appery.io Push Notifications, Server Code, API Express or the Database for its backend. Your app can also easily connect to any 3rd party API. To test the app, you can launch it directly in the browser. This is the case where you can test everything but the native functionality. To test any native functionality, you can test the app inside the Appery.io Tester app for Android or iOS. This app allows you to test your hybrid app without installing it on the device. A Weinre debugger is also available to debug the app when installed on the device. When running and test the app directly in the browser, you can use the powerful Chrome Developer Tools for debugging. We have a number of short videos on building an app on our YouTube channel here. This is the first webinar in our 2016 webinar series and introduces you to the App Builder and how to build apps with Ionic/AngularJS. To learn more how to build apps fast, go to our YouTube channel. This 3-minute video shows how to create and test a REST API. Uber API is used in the example. Check out many other videos on Appery.io YoutTube channel. For years, developers had to make a choice: build a single hybrid app with a so-so user experience, or build a native app for each platform with a great user experience. Developers don’t have to make this choice anymore. By integrating the Ionic SDK into Appery.io, developers can build enterprise HTML5/hybrid apps on a single code base that offer a native experience across all platforms. The Appery.io platform’s visual tooling lowers the skills barrier, empowering a broader base of developers and business analysts to create effective and intuitive mobile applications. You are going to build a todo app. The app will have two pages. 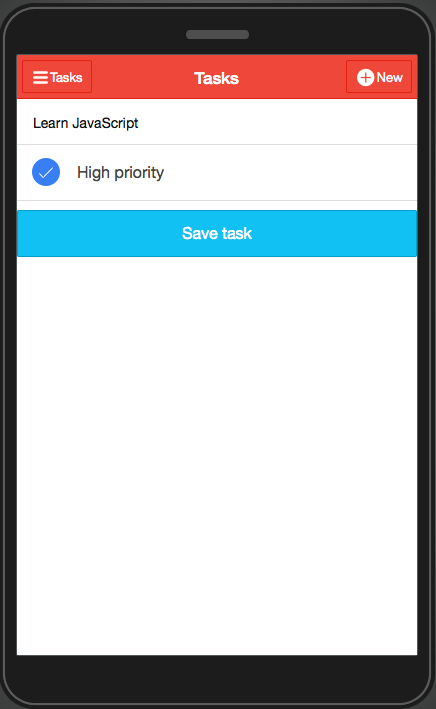 On the first page, you will be able to see a list of all tasks and also mark a task complete (delete it). On the second page, you will be able to create a new task. You can see how the app looks below. The first page lists all the tasks. You can also mark a task completed (delete it). On the second page you can add a new task.